I was experimenting the other day and really wasn’t sure how this would turn out as I was combining different Lasagna recipes. It was the first time I had ever made Spinach noodles and I have to say…that unless you have an entire day to devote to this, then don’t start it. 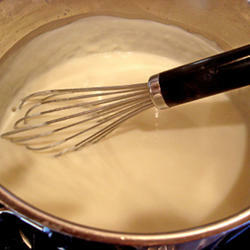 I think it would be easier to make it in segments – Make your sauce and meat in advance and even the béchamel sauce. This is kind of a cross between Lasagna Verde because it has Bechamel sauce and also regular Lasagna because I used more tomato sauce. It’s so much more delicate because of the thin homemade Pasta and less meat. It is something really special and turned out absolutely DELICIOUS! Wash and trim Spinach. Place it in a steamer and steam for about 2 minutes over boiling water until limp. Drain and squeeze out the moisture. 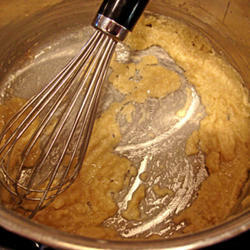 Put it in a food processor or chop it fine to mix into a paste. Pour your flour onto your work surface. (I use those plastic flexible cutting mats to cut down on the mess). Add the salt. Make a well in the center and add your eggs and oil. Mix it all up with a fork or your fingers to get everything together. Add the spinach paste. Mix the spinach in and get it into a rough ball. Now start kneading it. I probably kneaded for about 8-10 minutes and you can feel the dough changing and getting more elastic and soft as you do this. If it’s too dry…add touch of water. If it’s too sticky add a little flour. When you’ve formed a nice smooth ball of dough, wrap it up in plastic and let it sit for about ½ hour. After sitting…it can rolled in a pasta machine or rolled by hand and cut. When using a pasta machine…cut the ball into quarters. Flatten the quarter and start feeding it through the rollers at the widest setting. Double it over and repeat. Then keep feeding it through until you’ve reached your desired thickness. It can get quite long and at this point just cut it in half and then feed it through. Roll them out to the thinnest setting...this is what makes this so good. Hang it over a rack or lay it on a clean towel until you have them all made. Bring a large pot of water to a boil. Add some salt. Carefully add your noodles and let boil for about 3 minutes. Drain and plunge them into cold water and flatten them out and drain them on paper towels until ready to use. I really like using San Marzano canned tomatoes for this…there’s something different about them as they just have a really good sweet tomato taste. In a skillet, heat the olive oil and add the diced bacon. Cook until the bacon starts to crisp a bit. Add in the onions, garlic, celery, oregano, rosemary and cook until the onions are soft and transparent. Chop or roughly puree the tomatoes. Add them to the skillet. Add salt and pepper. 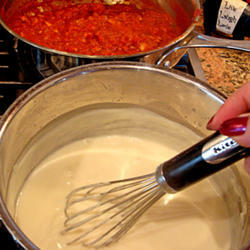 Simmer on medium heat (occasionally stirring) for about ½ hour until sauce is thickened. Remove from heat and let it cool down a bit. Heat the milk in the microwave until warm being careful not to scald it. In a saucepan, melt the butter and add the flour. 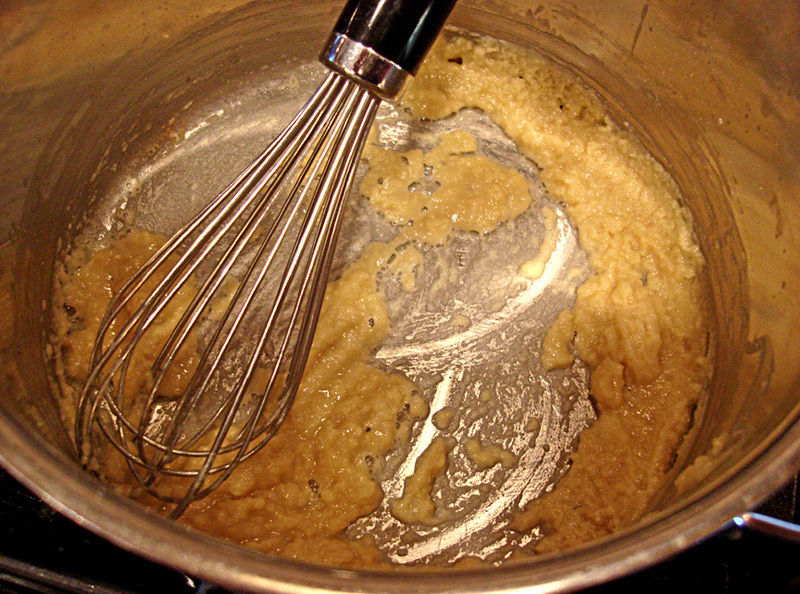 Make a roux by constantly mixing and whisking over medium heat. Remove it and cool it down for about a minute. Return it to the heat and gradually add in the warm milk. 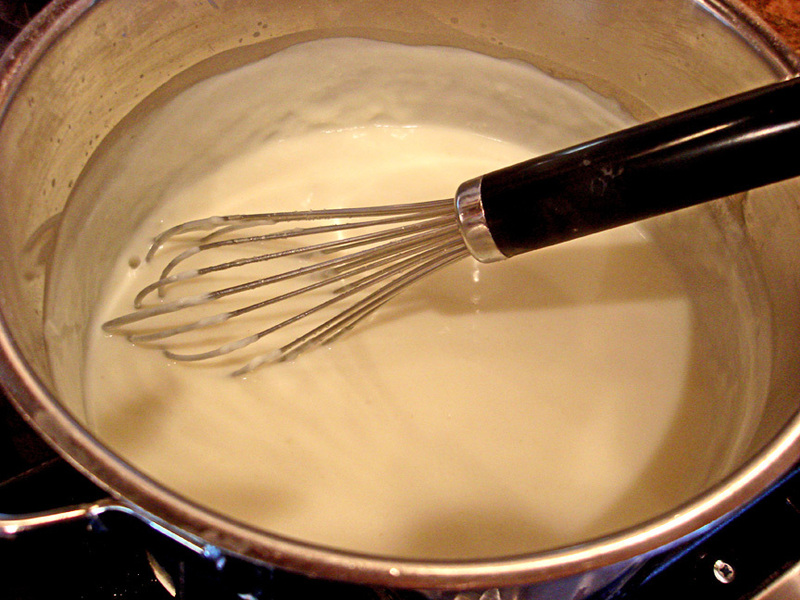 Keep whisking this until it is smooth and creamy. Let it cook for approx 10 minutes (constantly checking and stirring) until it’s thickened. 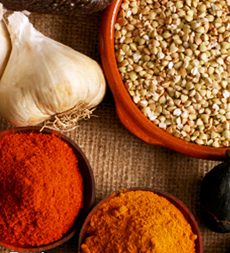 Add salt to taste as well as the nutmeg. Remove it from the heat and let cool. Heat the oil in a skillet. Add the meats and mix together and break it all up. Add the garlic. Saute until meat is cooked and browned. Crumble it into a finer consistency when cooking. Add salt and pepper and let cool. Mix the ricotta with the egg and spinach…add some salt and pepper to taste. Keep the other cheeses and butter for layering. In a 9 X 13 baking dish – spread the bottom with a little of the tomato sauce. Cover with a couple of the spinach noodles. Overlapping a bit is fine as they're so thin. 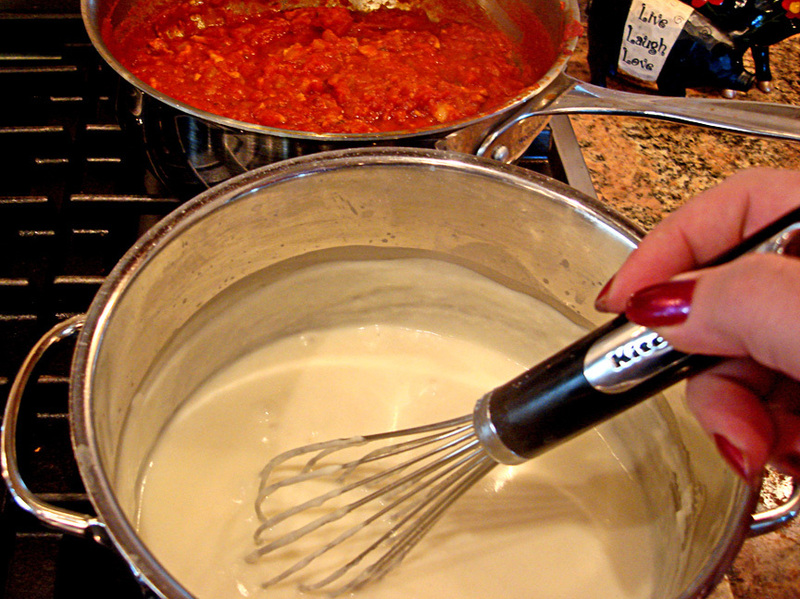 Spread a thin layer of the Bechamel sauce (about ¼) over the noodles. Finish it off with the remaining Bechamel, Parmesan Cheese and Mozzarella. Add a few little slices of butter on top. Bake in the over for 1 hour until it’s all cheesy and browned on top!